Omphacite and Jadeite are both members of the pyroxene group of rock forming minerals. Up to a few years ago they were easily separated by the dark green colour and higher optical properties of omphacite. More recently finer green specimens with properties very similar to jadeite have proved difficult to determine from jadeite using standard gemmological tests. Their visible spectra are almost identical in some specimens and in some others very slight differences may be seen as shown below. It has been reported that confirmation can only be resolved satisfactorily by Raman Spectroscopy, it seems now that the nomenclature for green omphacite should be internationally acceptable as Omphacite Jade. When comparing these two spectra with a direct vision spectroscope, as seen here, it is difficult to calibrate by eye alone the lines which appear in the deep red and blue areas with any certainty. In the spectrograph above the slight variations in the absorption plots can be seen in the peaks at 688nm. and 691.5nm. Also in the blue area the distinctive peaks in jadeite at 433nm and 437nm. are absent in in the omphacite plot. Instead there is a strong peak at 452nm. but not in the jadeite plot. It has been reported that peak at 437nm. has been seen in other specimens of omphacite so this may not be distinctive only for jadeite and so require Raman spectroscopy to resolve the issue. which has the better detection and resolution through a direct vision spectroscope? This question has arisen several times in conversation with my colleagues. The answer is really dependant on the circumstances in which the instrument is being applied. In one case I find the human eye will detect finer and weaker lines which I am unable to capture on a digital camera. This occurs usually in the region between 440nm in the blue to 650nm in the orange-red which one would expect with normal eye sensitivity. In the other case I find a digital camera with a ccd sensor can miss these fine lines unless the exposure is carefully set, and even then certain areas are still a problem. However one area in which it performs better than the eye is in the deep violet. In this area it is generally difficult to resolve any lines present due to the poor eye sensitivity at those wavelengths and as we become older our capability to receive transmission in the violet region gets worse. To explain how the camera performs in the violet and even beyond have look at the images below . 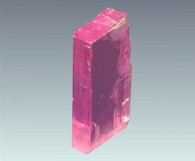 The specimen used was a fine pink rhodochrosite on loan from Alan Hodgkinson from which I photographed the spectra. There was a slight variation in the three optical directions in the width and strength of the two broad bands at 450nm and 550nm, these being stronger in the o-ray. Observation by eye even with a 150W fibre optic lamp showed no transmission below 415nm. (top spectrum) However my spectrometer scan produced the plot seen above with transmission below 405nm. to show this absorption peak centred at 410nm. Also in the plot we see two other small indications (marked red on plot) the strongest about 390nm. The question arose - Could the camera, given enough exposure, transmit in this area? After several long exposures I finally captured this transmission to show the narrow absorption lines within this area. (middle spectrum) As you can see the remainder of the spectrum is now very over exposed but this was improved by stitching these first two images and producing the bottom spectrum. Looking at the spectrometer graph above these differences can be seen in the absorption dips in the lines at those points. Further more I was always aware that other more subtle variations occurred throughout the rest of the visible spectrum and I have now confirmed these with reference to the above graph showing the three spectrometer plots. A 2ct. 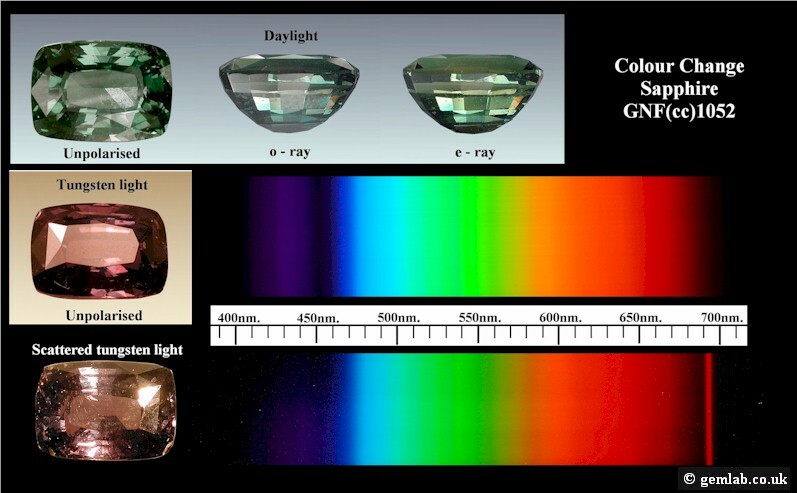 green sapphire with a distinct "Alexandrite Effect" was examined and found to exhibit some unusual spectra. This was cut in Sri-Lanka and at first I assumed the rough had been mined locally. I have examined several blue sapphires from Sri Lanka which show a colour shift from some shade of blue in daylight to a purplish or violet colour in tungsten light. This one was different, being green with a slight greyish blue overtone in daylight, changing to a purplish red in tungsten. As expected there was no response to UV light but it appeared a purplish red when viewed through a Chelsea filter. At first the spectrum seemed to be typical of natural green sapphire but had a surprise in store which I discovered during observation in scattered tungsten light. On further enquiry I learned that the rough material had come from Madagascar. 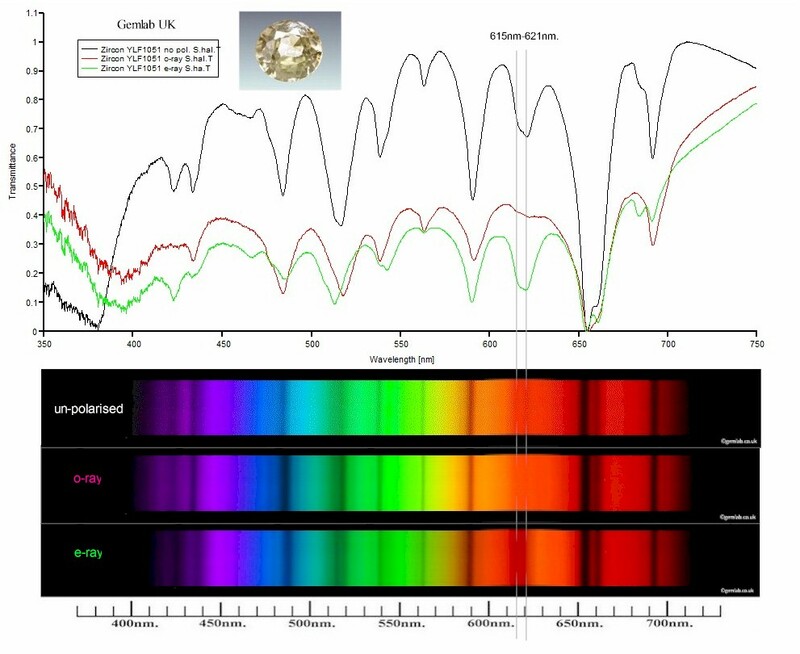 The main feature in the unpolarised spectrum shown above is the intense absorption band in the blue which is usually present in most natural green sapphires. A faint absorption is seen centred at 565nm with a weaker and narrower band just to the short wave side of this about 537nm. Transmission in the orange - red begins to fade out from about 670nm. As this sapphire has been cut with the table facet at almost 90� to the optic axis dichroism is not detected when viewed face up. In the ώ ray the spectrum is similar but with stronger absorption. The band in the blue becomes broader, and the bands in the green, which are partly responsible for the colour change, are more easily resolved. To see the spectra of the ώ and ε rays go to GN3 Bluish green in the main database. 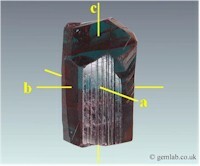 It must be remembered that the gemstones shown in the database are shown as seen in day light and the accompanying spectra have been photographed in tungsten light. In certain cases a stone may appear a different colour when a colour shift or change is encountered. This sapphire under normal transmission methods shows a spectrum as in the unpolarised version shown above. However when the orientation of the stone is altered, to allow the scattered specular internal reflections to enter the spectroscope, the secret is revealed and a bright fluorescent line is detected in the deep red indicating the possible presence of chromium. In this mode transmission in the blue is poor and the absorption bands in the green are stronger and more easily resolved. Colour in green sapphire is usually attributed to a combination of Fe2+ - Ti4+ and Fe3+ - Fe3+ Here we now have evidence of possibly chromium or vanadium contributing to the colour. This is at present under investigation. We leave the year 2012 on a high note by winning the "Treated Category" in The Gem - A Photographic competition. The image shows two spectra from the o-ray and e-ray of a Mogok zircon, which have been altered to become an ellipse and applied to a gradient background. On a technical note, the main variation between the two rays is to be seen in the orange part of the spectrum. Here the two lines at 615 nm and 621 nm in the e-ray have strengthened and merged to become an additional dark band. This is evident in the ellipse at the bottom left in the picture. Other minor variations can also be seen. The original images were photographed through a small diffraction spectroscope similar to the image in my entry on this page for February 2011 which shows the unpolarised version as seen through the spectroscope. 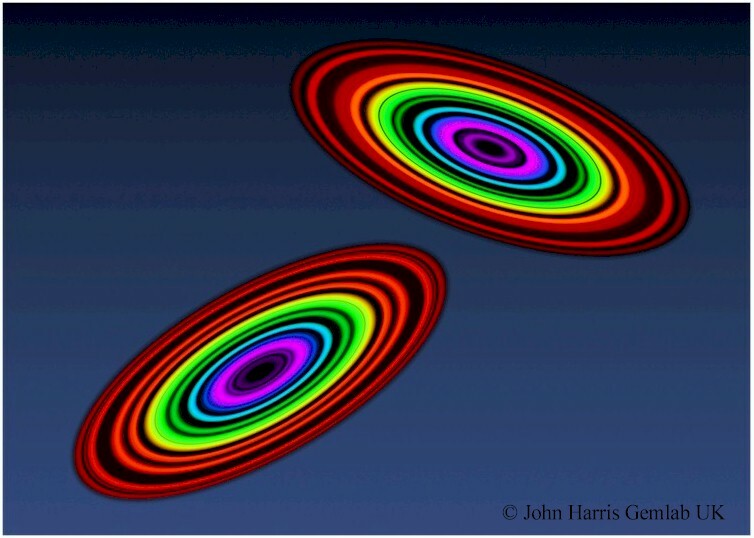 Computer technology then enabled me to convert these images to appear as two distant galaxies in "Close Encounter"
No you have not read it wrong just read on - Below you will see the optical transmission signal of a synthetic ruby spectrum produced on a chart by a gem spectrometer. With this is an image of the gemstone together with an image of its visible colour spectrum which I photographed through a direct vision diffraction grating spectroscope. Now in our gemmology world we are inclined to refer to this display of energy as a spectrum without further qualification. What we really mean is an "Optical Spectrum" which we can see as described above. Here I shall present this energy, some of which has been transmitted or absorbed by the synthetic ruby so that you can hear it as well as see it. The spectrum analysis of sound is analogous to splitting white light into its component colours by means of a prism. As a result you will be able to follow the progression of the sound track in relation to the visible optical spectrum and the graphic optical signal on the chart. When you click on PLAY AUDIO SIGNAL in the red hyperlink below the images, providing you have a media player installed, and your sound volume set sufficiently high, you should receive the sound track. When it starts your media player window may open, at which point I suggest you immediately minimise it to the bottom bar so that only my images remain on screen. This way you can then follow the audio signal along with the optical signal as it descends into the deep violet and then climbs back up to the blue transmission window. Here the two small absorption inverted peaks at 468nm. and 475/476nm. are difficult to detect on sound but you will then hear it descend again into deep absorption as it rumbles along around 550nm. in the centre of the green part of the visible spectrum. From here the pitch climbs again into the equivalent of the orange area and levels off with a slight drop around 659nm. and 668nm. The next sound you will hear is a rather sudden sharp crescendo which is due to the energy being released by the ruby in the visible fluorescing doublet as it peaks at 693/ 694nm. After this the sound drops back as it is absorbed in the deep red of the optical spectrum beyond which our vision would no longer apply. Wolf Kuehn for the graph scanned on a GL Gem spectrometer. www.gemlab. The optical properties of a biaxial crystal are complex and not always understood by many. I shall try here to illustrate the relationship between the three main important characteristics of colour using Alexandrite as a prime example. Acknowledgement is given to Alan Hodgkinson for the loan of this crystal during my investigation. 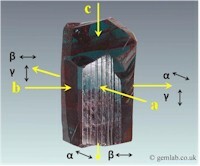 First we must look at the optical vibrations in relation to the three orthorhombic crystallographic axes in a single crystal of alexandrite as shown below. Fig. 1 shows the three crystallographic axes a, b, and c. The crystal is orientated with the "b" axis placed horizontally to the viewer. Fig. 2 The symbols α (alpha) β (beta) and γ (gamma) represent the three polarised rays, whose vibration directions in alexandrite coincide with the crystal axes, indicated by the accompanying arrows. Therefore at each of these positions only two of the three optical vibrations will combine to produce the pleochroic colour seen in that direction. As these two polarised rays are vibrating at right angles to each other each one can be separated with the use of a polarising filter. Linking Fig. 2 and the image chart below you will see that by using a dichroscope the colours of the two directions of vibration beta and gamma can be seen along the a axis, alpha and gamma along the b axis, and alpha and beta along the c axis. The particular hue will vary depending on whether the specimen is viewed in daylight or tungsten light but for the purpose of relating them to the spectroscope images they are shown as seen in tungsten light. Following on from my previous entry in February I shall stress the necessity to use a diffuser filter to smooth out the spectrum and avoid glare and reflections. Strictly speaking my images this month are not really through a traditional spectroscope but straight off the surface of a compact disc. Compare the two images below. In the one on the left the light from the gemstone passes freely to the CD whereas in the image on the right the light has been diffused by a simple piece of draughtsman's tracing paper. You can see the tip of the fibre optic wand hovering over the CD. In each case the gemstone is secured on to the tip with a piece of modelling clay. On the left is a pink cubic zirconia giving us a spectrum due to erbium which is rather patchy as the light exits via the various facets. By contrast on the right the neodymium spectrum from a synthetic perovskite which has a diffuser attached is more evenly spread and continuous. 1. A multi - faceted stone may transmit light in a series of windows which can result in multiple images. Capture this light on a diffuser filter for a smooth spread of light. 2. Reflection of light off the surface of a facet will cause a distracting glare. Always remember - no absorption = no visible spectrum. Check the optical path. 3. If stray light from any other source also enters the slit of the spectroscope you will lose part of the image. Work in subdued light conditions. 4. 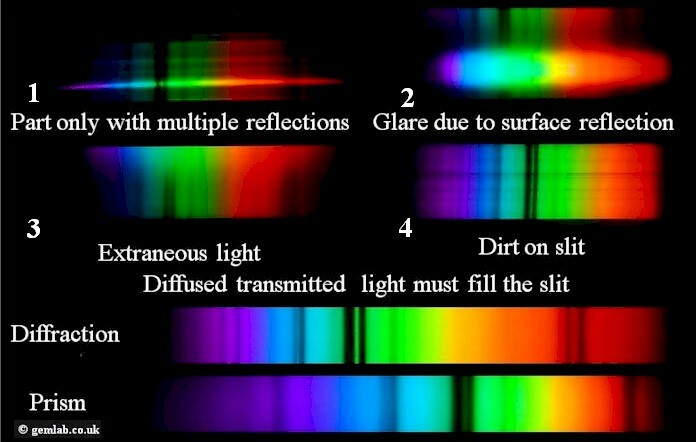 Dirt on the gemstone or on the light entry slit of the spectroscope, whether a diffraction or prism type, will also cause a problem with dark horizontal streaks. 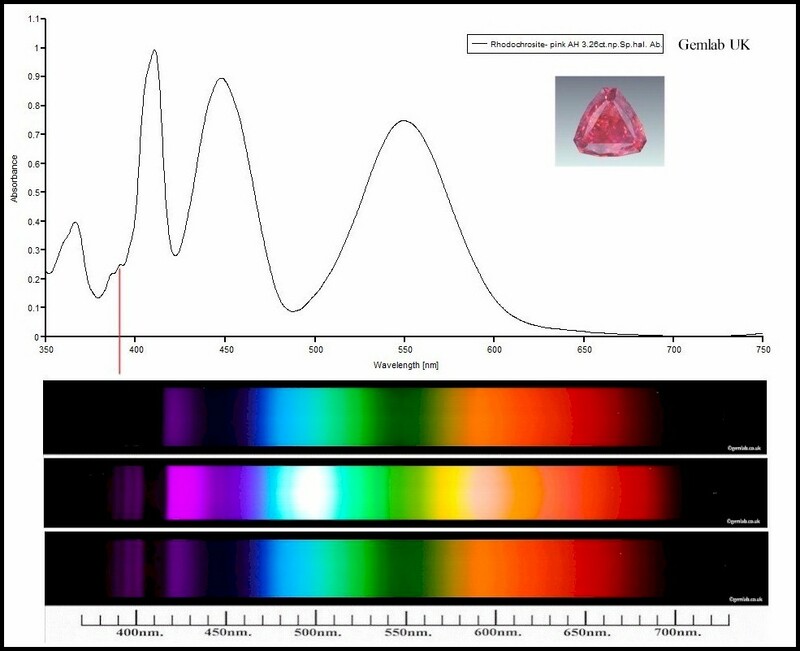 Pink cubic zirconia often shows a good rare earth spectrum due to erbium The images below show this under the various conditions described above. In my November 2010 entry (See below) I describe my method of introducing the emission lines from a triphosphor fluorescent lamp into the optical path as a guide to calibration. In that case the two lines at 405nm. and 436nm. are seen in conjunction with the absorption line at 415nm. in a diamond spectrum. This works well when there is a good bright spectrum from the gemstone but if transmission is poor and the spectrum is weak from a translucent material such as jadeite this can deteriorate further on introducing the emission spectrum. To resolve this problem I have used two laser pens of known wave length which I reflected off the surface of the specimen together with the transmitted tungsten light from a fibre optic below. The result shown below is from a green jadeite bangle. As expected no chromium lines are seen in the red in such a pale greyish green jadeite but the two lines in the blue due to iron confirms it's identity. The reason for using two lasers was so that the distance between the two emission lines is known at 270nm. This greater distance has an advantage over the shorter distance of 206nm. between the two lines in the triphosphor spectrum and is therefore more accurate. When this distance is compared to the distance in pixels on the monitor then a formula can be devised to calculate the position of any other lines on the spectrum. It also gives a basis on which to build a scale as you see here. This has an accuracy within one nanometre. 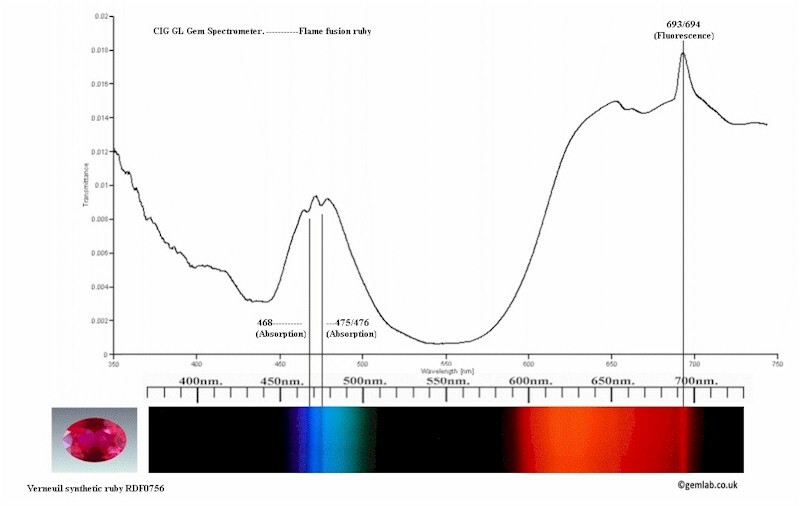 In January last year I discussed the emission spectrum of a triphosphor fluorescent lamp. As some students find it difficult to understand the relationship between a spectrum chart produced by a spectrophotometer and a visual spectrum I thought this may be a good example with which to show the correlation between the two types. In June this year I recorded the above spectrophotometer chart on a G.L.Spec. 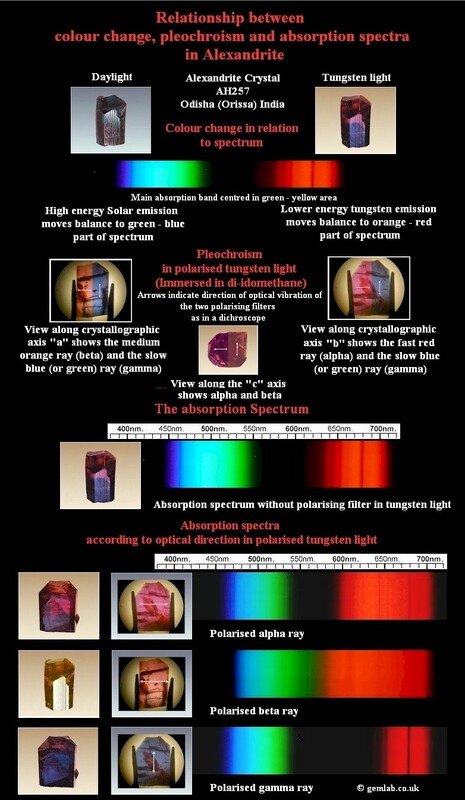 instrument produced by Wolf Kuehn of the Canadian Institute of Gemmology then added the colour coded wavelength list and my spectrum photograph to illustrate the link between the two forms of spectrum. From this you can see the emission peaks which go to make up what the eye perceives as "white "light even although it is not a continuous spectrum as we get from a tungsten bulb. In November 2010 (See below) I discussed how to locate the position of the absorption line at 415nm. in diamond. The filter used did help to reduce some of the glare from the transmission and the emission lines from the fluorescent lamp gave a guide in calibration. Since then a new improved version of Dr. Wm. 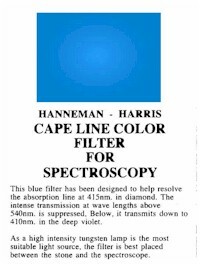 Hanneman's Cape line colour Filter has been produced which was introduced at Tucson and is now being marketed. The new filter will now transmit down to 410nm. to allow better resolution of the cape line. Although there is some transmission in the red in intense light sources it does not detract from observation in the shorter wavelengths. 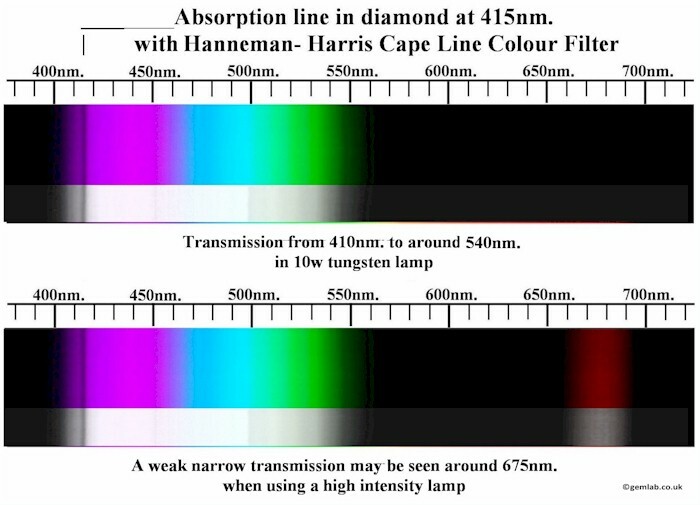 "This blue filter has been designed to help resolve the absorption line in diamond at 415nm. The intense transmission at wavelengths above 540nm. is suppressed. Below, it transmits down to 410nm. in the deep violet. as a high intensity tungsten lamp is the most suitable light source, the filter is best placed between the stone and the spectroscope. NOTE; - It must be remembered that the sensitivity of the human eye in recording light transmission in the shorter wavelengths deteriorates with age which may present difficulty in detecting the line at 415nm. in diamond even with the aid of a colour filter. The above spectacular spectrum was photographed from an unusual colour change violet zircon. This stone came to me via Alan Hodgkinson by kind permission of the owner Oliver Waldis and is believed to have undergone low heat treatment. We look forward to hearing more of this material once further research has been carried out. My photograph of the spectrum shown here was taken in un-polarised tungsten light. The spectra of the ordinary and extraordinary rays will be included in the spectra of purple and violet gemstones when the Excel File for that group is published. These spectra account for the contrasting dichroism and also the colour change from violet in sunlight to bluish green in tungsten light. The 415nm. line in diamond can be difficult to resolve and even difficult to locate for student spectroscopists. One problem is to achieve sufficient transmission on the shortwave side of this line to separate it from the cut off, which often occurs, without the glare caused by the longer wavelengths in the remainder of the spectrum.. There are various blue filters available for this purpose and here I have used a Hoya photographic No.80A which reduced transmission in the red down to about 625nm. close to the 611nm. emission line and has also absorbed the yellow about 575nm. This has left sufficient transmission in the deep blue to violet area to isolate the line at 415nm. However in the coloured version of the diffraction spectrum it is still difficult to locate without a guide and knowing exactly where to look is the other problem. If we now introduce the emission lines from a triphosphor energy saving lamp in the optical path (try this using a mirror - you only need the strongest lines to show.) we can find this elusive line sitting nicely between the 405nm. and 436nm. emission lines. I have placed a de-saturated image in black and white below the coloured one in which it is easier to locate the lines with the stronger contrast. The spectrum of the rare earth element neodymium is seen in several minerals and man made artificial products. 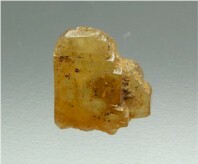 Often it may be only partially seen as a weak absorption of the yellow when a small percentage is present, as in apatite. Artificial materials such as pink YAG may resolve the group of fine lines in the yellow but often the lines in the red and blue are less well defined. In some gemstones lines in other areas of the spectrum may be obscured due to strong absorption by the host material. The above biaxial crystal of the man-made laser material neodymium pentaphosphate, kindly on loan from John Koivula, produced three variations of spectra according to the optical direction in which they were viewed. In some directions the groups of lines in the blue, green and yellow could not be resolved as they coalesced to form a broad dark absorption band. All these lines are not visible together in any one direction but to let you see the extent of the truly dramatic spectrum I have linked several images together ensuring that the complete spectrum has been carefully calibrated to give a true representation. For those with a spectroscope with a built in wavelength scale you may wish to check out it's accuracy and compensate if necessary. 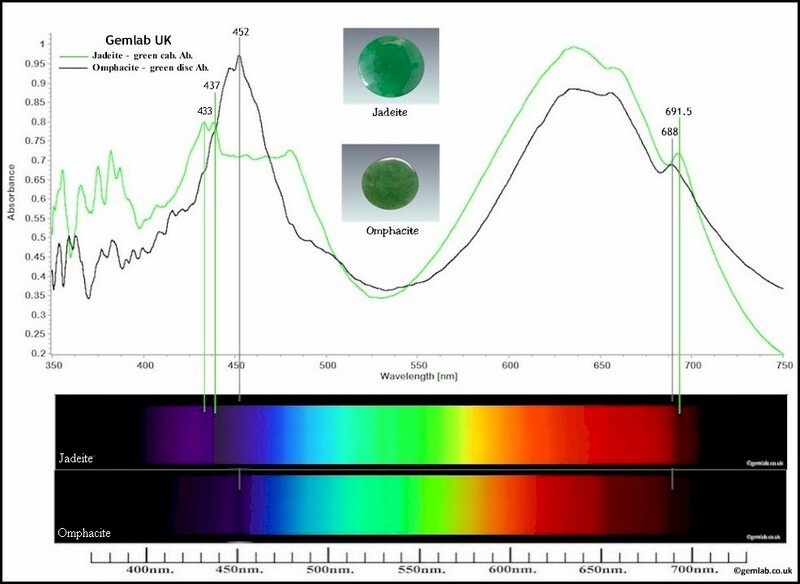 Even if it is a more simple instrument you may need a marker to compare the position of absorption lines in a gemstone spectrum. Here I have simply rubbed some household salt into the wick of a candle which, when lit, shows the bright emission lines of the sodium doublet. As you can see candle light consists of mainly red and orange light with weak transmission in the green and almost no blue. For this reason Alexandrite worn by the Russian aristocracy in candlelight would have exhibited such a magical red glow. As you can see the above somewhat unattractive brown crystal produced one of the most outstanding rare earth spectra I have seen. The material is of interest mainly to the spectra enthusiast or to the mineral collector. This yttrium phosphate often contains small traces of cerium, erbium and thorium which are probably responsible for the striking spectrum. If you can observe it's spectrum do so while rotating a polarising filter and watch certain lines dance from side to side, as each of the two vibration directions come into line, according to the tetragonal symmetry. These spectra are the "Colour signature" of this particular specimen but may be seen to some degree in other samples of Xenotime. A colleague of mine described this as "Beautiful" and I then that realised that most spectra are. I was so taken up with the technical aspects of spectroscopy that I had missed the obvious as so often can happen with our work. 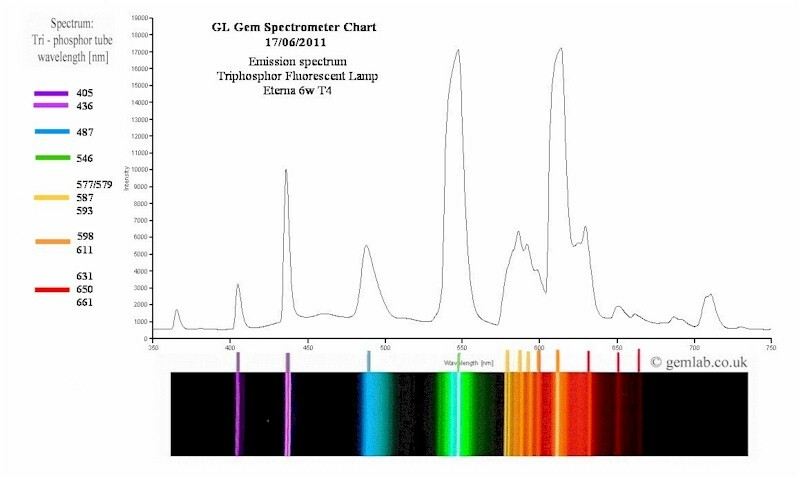 This is the diffraction type emission spectrum of a triphosphor fluorescent tube commonly called an "Energy saving lamp" Have a look with your spectroscope and enjoy the spectacular view. The brightest line in the orange lies at 611nm. The one in the deep violet at 405nm. has been captured by the digital camera but you may not be able to resolve it by eye. Some of my colleagues say they can see it but I can't - Perhaps it's something to do with age? Have fun while you can! This spectroscopy gets into your blood! Now what do think this one might be? It's what you might see if you are holding a gemstone in your fingers while you search for a spectrum. Stray light enters your spectroscope which has transmitted through the edge of your skin. Yes it's blood, not just any old blood but my last drop sweated for you in the service of gemmology.